reviewing and renewing. It is a time to be savored, like the soup in the kettle atop the wood burning stove that warms the cozy living room on a frigid evening. 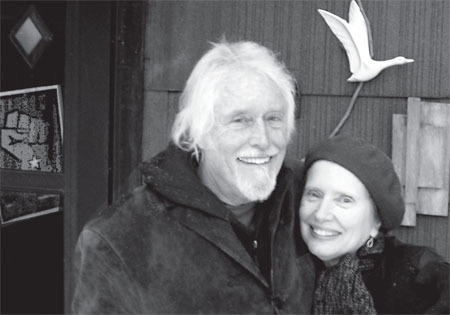 For Harvey and Susie living in tune with the earth and its cycles is essentially healing, for them and the world. The vision they share joined into a loving domestic partnership seven years ago. However, in reality it is the continuation, says Harvey, of “a long and winding road, with a deep friendship.” They’ve known each other for about forty-five years. In 1966 Harvey began his on-and-off career as a longshoreman at the Port of Milwaukee. (“Yes, I’m definitely a union proponent. And no, I’m not one of Scott Walker’s fans,” he asserts, adding, “You can put that in bold print!”) Soon his coworker, “the other long-haired dude,” and he became buddies. His friend was Susie’s husband, Fred. A strong friendship grew among the three of them. As a K-12 art teacher, Susie would sometimes invite the poet, Harvey, to speak to her classes about poetry. A native to the part of Milwaukee then called the Town of Lake, Susie later moved to Bay View where she and her husband lived for thirty-six years before he passed away. She has a daughter and two grandchildren. In 1976 Harvey purchased their current home, a duplex on Booth Street. He was looking for a base of operations for a lively life that includes performing poetry and music, teaching, traveling and the longshoreman work that provides a flexibility of schedule. The house, a handyman’s special, had just had its back cottage razed. These days that spot is filled with a large garden that he and Susie nurture through the warm months. Among their many interests and activities is “real food.” (You can learn more about this under Real Food at HarveyTaylor.net) Their hope is that more and more people become involved in the food cooperatives, community gardens and home gardening so popular in Riverwest. In their own yard they grow a plethora of vegetables along with their apple, pear, and peach trees. They also transplant into their garden some of the wild plants they forage. Foraged foods are plants that are often seen as weeds by those unaware of their edibility and high vitamin, mineral and protein contents. Dandelions, purslane, plantain, lambs quarters, violets, and nettle are just some of the plants they add into their super-healthy diet. Self-described “opportunistic harvesters,” after receiving permission Susie and Harvey will also happily pick an untended fruit tree of its bounty. “We’re very serious about this,” Susie says with a whimsical grin. Community is paramount for Harvey and Susie. They buy their plants at Fischbergers, shop at the Riverwest Coop, attend the spaghetti dinners and other community events. Susie sews for Riverwest Yogashala as well as practicing yoga there. She shares her appreciation of Yogashala’s outreach to the community’s elders and disabled. Susie and Harvey are adding their voices to the Milwaukee River Advocates, and are long-standing, supporting members of the Riverwest Artists Association. Happy Valentine’s Day, Harvey and Susie! Saturday, April 20 at the 19 Street Coffeehouse Friday, April 26 at the Urban Ecology Center He hopes to see you there!